31 July 2018 — London, UK and Boston, MA — Alternative metrics provider Altmetric today announced that it has added citation data from research insights platform Dimensions to all of its tools and services, providing extensive visibility of where and to what extent scholarly publications have been cited by other academic works. Part of technology company Digital Science, Altmetric collects online mentions relating to published research to make it possible for authors, publishers, institutions and funders to more easily identify and monitor the academic and broader influence of their work. The openly-available Dimensions citation data joins mentions from sources such as the mainstream media, patents and policy makers on Altmetric details pages, which provide a complete record of all of the online mentions found for an item. The details pages can be accessed by clicking on the Altmetric badges where they appear on publisher sites and institutional repositories, or within the Altmetric Explorer platform, where users can now sort search results by citation counts and export the data for further analyses. The Dimensions citation data are live now in the Altmetric Explorer and details pages. Altmetric’s mission is to track and analyze the online activity around scholarly literature. It collates what people are saying about published research outputs in sources such as the mainstream media, policy documents, social networks, blogs, and other scholarly and non-scholarly forums to provide a more robust picture of the influence and reach of scholarly work. Altmetric works with some of the biggest publishers, funders, and institutions around the world to deliver this data in an accessible and reliable format. Find out more at https://www.altmetric.com and follow us on Twitter @altmetric. 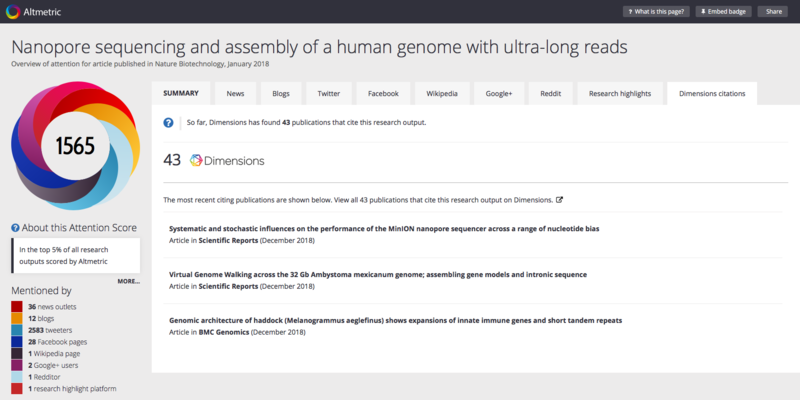 Dimensions is a research insights platform that re-imagines discovery and access to research. Developed by Digital Science in collaboration with over 100 leading research organizations around the world, Dimensions brings together grants, publications, citations, alternative metrics, clinical trials and patents to deliver a platform that enables users to find and access the most relevant information faster, analyze the academic and broader outcomes of research, and gather insights to inform future strategy. Visit https://www.dimensions.ai and follow on Twitter @DSDimensions. Altmetric and Dimensions are supported by Digital Science.